UPDATE: August 9, 2013 - The Decision of the Ontario Municipal Board has been released; the redevelopment of the Post Office site has been approved per the application, including the number of underground parking spaces as outlined below. ► Click to view the OMB Decision (PL130223 - August 9, 2013). LOCAL BUSINESS GOES TO THE OMB: Centre City Capital's redevelopment plans for the Port Credit Post Office site are being challenged by a local business in Port Credit (Snug Harbour Restaurant) who are appealing the January 31, 2013 approval at the Committee of Adjustment (see below) in regard to the under-standard parking allocation at the site. The Hearing has been scheduled to begin on Monday, July 22, 2013 @ 10:00 a.m. in the Hearing Room (change) at City Hall. Case #PL130223. ► TOPCA Executive reps will be attending the Hearing and requesting Participant status (granted). ► Click to view the OMB Hearing NOTICE (2p PDF). 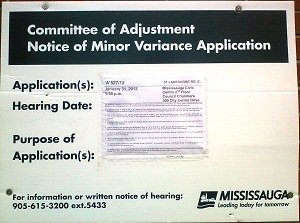 ► Click to view YourMississaugaBiz.com about the OMB HEARING (online article) or (JPG). According to Planning Staff, permits (including building and demolition) won’t be issued if the proposal is not in compliance with the Zoning By-law or has not achieved required variances to the by-law. Site Plan approval cannot be granted until the required variances are in place and the proposal is consistent with the by-law/variances. NOTE: The Port Credit Parking Study is 2 years overdue, and is supposed to advise on community parking solutions for continued densification and infill development on older sites which never had much parking. The C of A decision was taken without this information. A total of 83 parking spaces were approved by the Committee of Adjustment on January 31, 2013, whereas a minimum of 156 parking spaces are required under the By-law. UPDATE: The Port Credit Parking Study (see Item 3, pp75-97) was presented at the Planning and Development Committee on June 24, 2013. 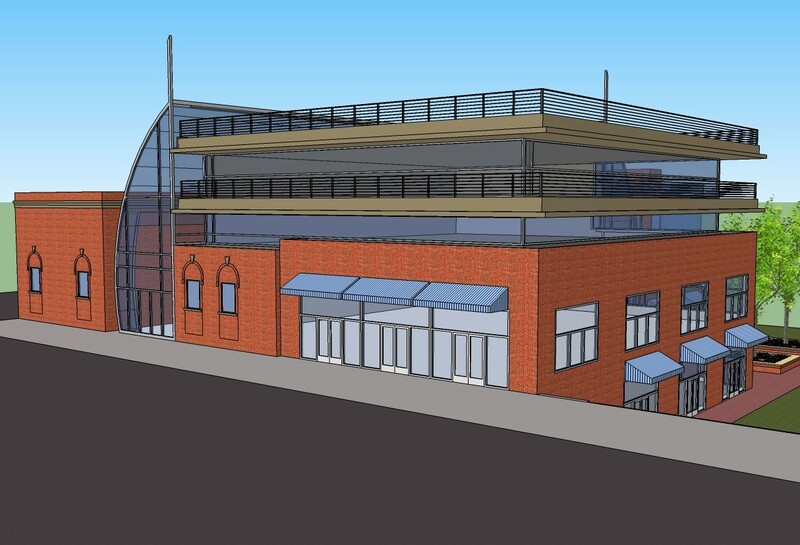 A public consultation will took place in Fall 2013 concerning potential locations for a multi-level parking structure in Port Credit. 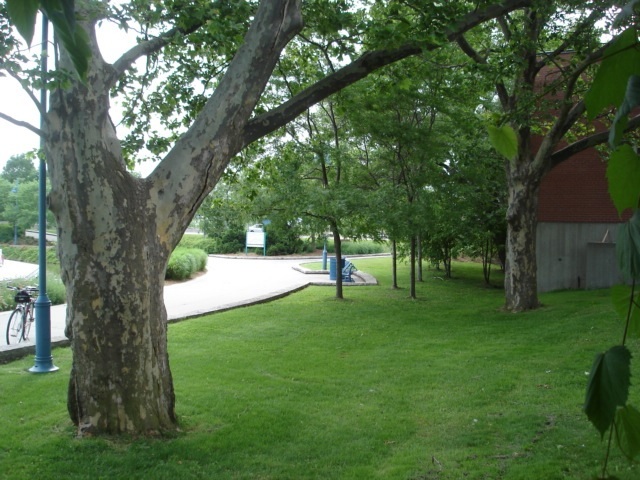 SIGNIFICANT TREES: The two largest trees on the Post Office site are London Plane or American Sycamore species. The largest (on the left) is 130” in circumference, 41” in diameter and approx. 60 years old. The tree shown on the right is 96” in circumference and 31” in diameter. If the underground parking proceeds, both trees will be destroyed. ► Click image for enlargement. 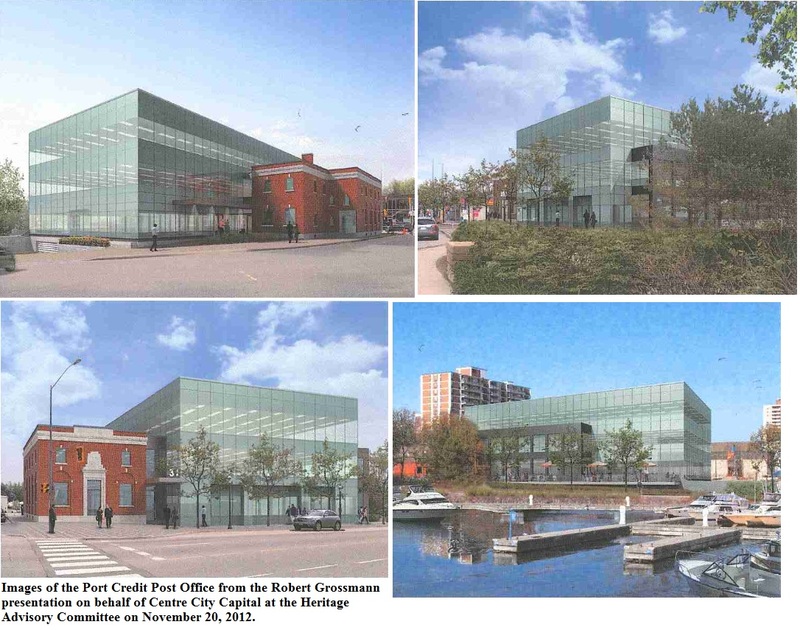 ► LETTER of COMMENT, Jan. 31, 2013 expressing concern about the heritage, planning, process and collateral issues pertaining to the Port Credit Post Office re-development application. Excerpt: "The effect of these variances [#1-5] is further imposition of this development on a fragile village / harbour / heritage environment, and encroachment on the public realm. We do not support any diminishment of the public realm in this area, even were the developer to make remuneration to the City." 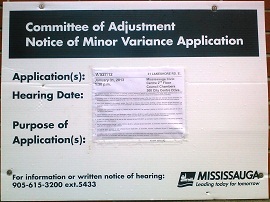 All the variances requested were granted. Note the parking allocation is under appeal at the OMB (see above). 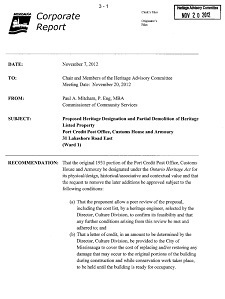 HERITAGE ADVISORY COMMITTEE (HAC): Meeting re the Port Credit Post Office redevelopment: January 22, 2013. ► Click for the HAC AGENDA containing the latest reports and images (and see below). ► Click for the TOPCA PRESENTATION, January 22, 2013 (34p PDF) outlining several heritage and process concerns. 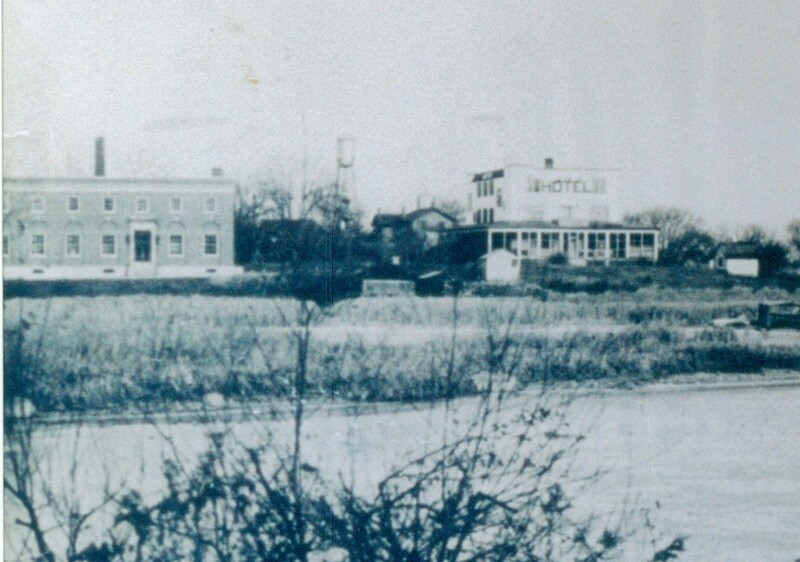 - 1931 building is uniquely located on a natural port and has served many historic functions over the years -- this needs to be respected; This is the 100% location in Port Credit over its complete history and its future. 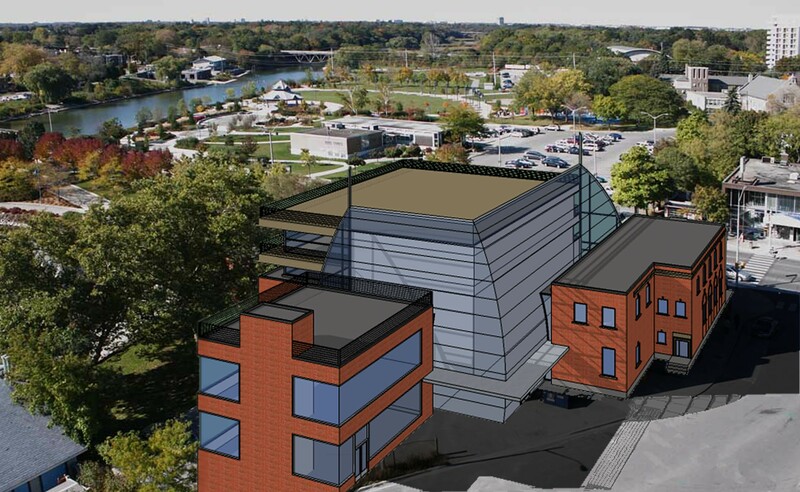 It was the mouth of the river, the Credit River itself, and its banks, that formed the heritage settlement pattern and the contemporary public realm reinvestment in the Harbour landscape, and this pattern should continue. 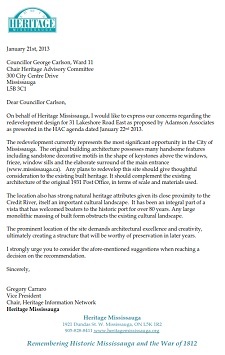 TOPCA is pleased to have been copied on the Letter sent by Heritage Mississauga to the Chair of the Heritage Advisory Committee (HAC) on January 21, 2013 in regard to appropriate heritage retention and redevelopment at the Post Office site. Heritage Mississauga (a professional heritage body affiliated with the City) is in alignment with the position TOPCA is taking and we are greatly cheered to see it! ► Click image to view full-size LETTER. 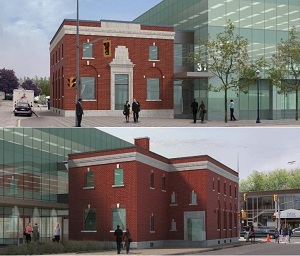 DEFEATED MOTION: Per a Motion by Ward 1 Councillor Jim Tovey, HAC was asked to approve the redevelopment plans from a heritage standpoint, based on retaining only 2 original walls of the 1931 structure. The HAC defeated this Motion on November 20, 2012. 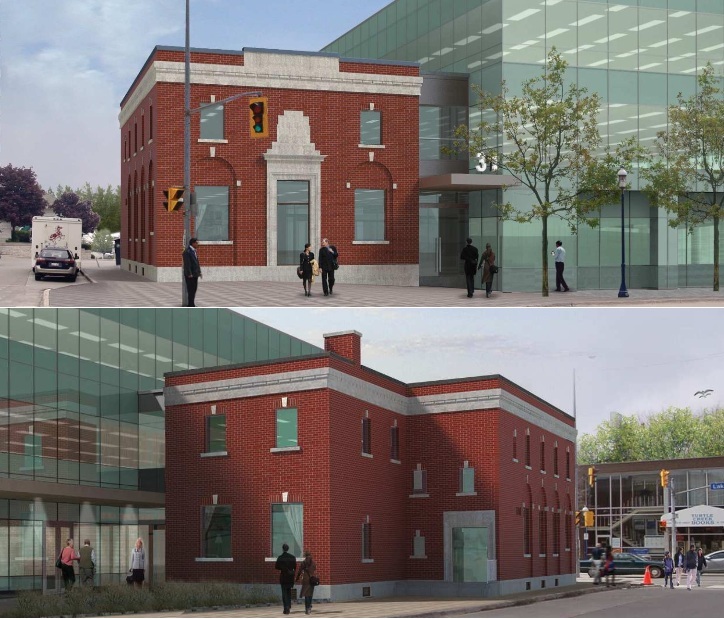 PRESENT STATUS: HAC approval of the developer's proposal was put on hold pending further revision, and the original 1931 building has been recommended for heritage designation. TOPCA was requested by the City's Director of Culture, Susan Burt, to meet with the developer (with facilitation by the Director) in order to identify and discuss the issues of concern. This facilitated meeting took place on December 14, 2012. 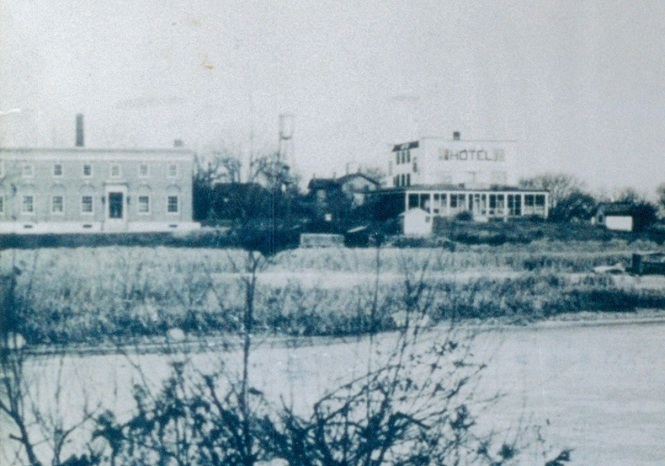 The developer is resubmitting his heritage application at the January 22, 2013 meeting of HAC and TOPCA plans to make a further Deputation concerning the revised proposal. A Summary of the Dec. 14, 2012 Facilitated Meeting will be released. ► CLICK HERE TO VIEW THE REVISED IMAGES. 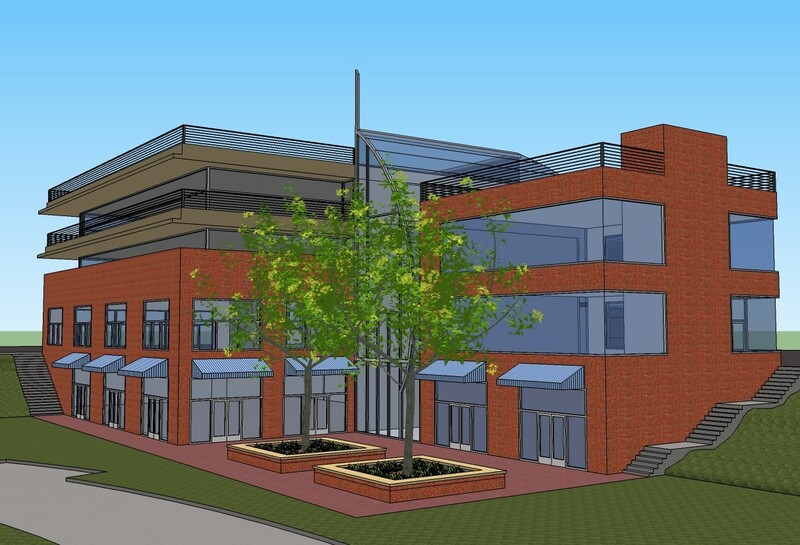 ► The developer's architect (Robert Grossmann) made a PRESENTATION (40p slide show PDF) at HAC on November 20, 2012 which contained images (shown left; click for enlargement) of the proposed 3-storey redevelopment which HAC members and the community had not seen before. 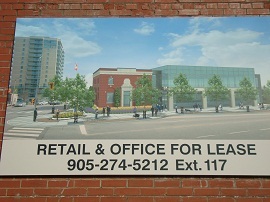 NOTE: The developer's proposal as presented by the architect does not match the 2-storey image posted on the wall of the Post Office (since July 2012, shown in sidebar at right). ► TOPCA made a PRESENTATION (24p slide show PDF) at the HAC meeting on November 20, 2012 questioning the PROCESS and advocating for designation of at least all 4 walls of the 1931 building (i.e. the building itself, not just 2 walls) and care to be taken in regard to the renovation of the rest of the building, the materials and the possible retention of the trees to better reflect the heritage of the site. 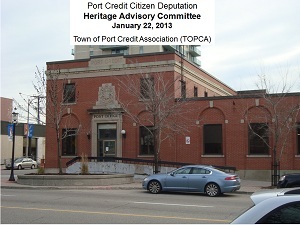 TOPCA prepared its own Heritage Impact Statement (shown left) and made a Deputation at the HAC meeting on Tuesday, November 20, 2012. ► View the Post Office site at 31 Lakeshore Road East (Google map -- take the Street View walkabout). ► Click for the HAC Agenda, November 20, 2012 and the Additional HAC Agenda listing TOPCA's deputation. 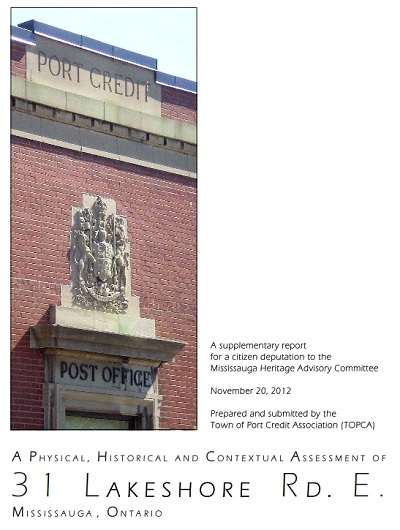 ► The following Heritage Impact Statements and reports were released to citizens on November 13, 2012 and are attachments to the multi-part HAC Agenda (covers shown below). Click each image to access the online section where the report is accessible. HISTORIC PHOTO: Click to view enlargement of this historic photo of the original Post Office building (without the additions) showing the western face with the original windows. DESIGNATION? 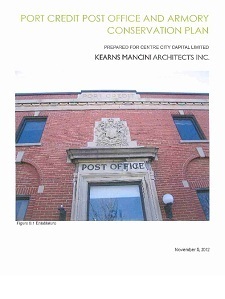 On January 31, 2011 the City's Heritage Advisory Committee (HAC) surprisingly opted NOT to designate the Post Office as a Heritage Property pending a review of the owner / proponent's site development plans. ► Click to view the visual CITIZEN PRESENTATION (29p PDF) made at the HAC meeting on January 31, 2011 on behalf of 7 community groups who are advocating for retention of the entire 1931 structure and the 2 significant trees. ► The City prepared a 27p Corporate Report for the HAC, recommending designation. ► Click for Letters regarding the City's intentions and developer response, as reviewed on January 31, 2011. January 2011: SOLD! 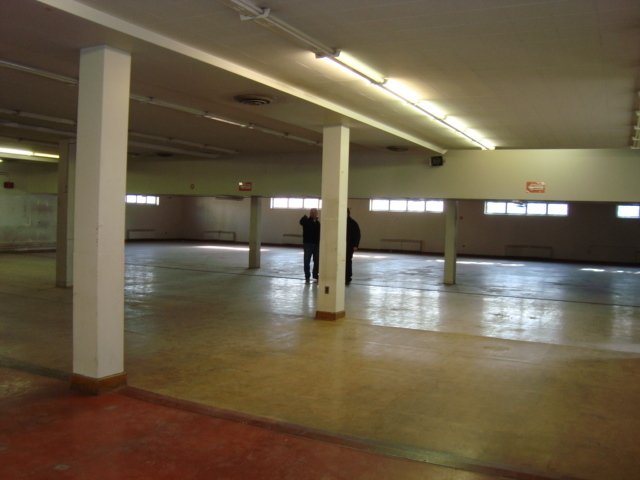 The deal has just closed (January 12, 2011) on the purchase of the Post Office property by local developer Dr. Bill James and son Jonathan James of Centre City Capital Ltd. Their plan is to work within the current zoning (non-residential, height limit of 3 storeys) to redevelop the site to include a conference centre element to complement their hotel just further south on Stavebank Road (the Waterside Inn), and possible additional uses such as office space and mainstreet retail which could include a bank. 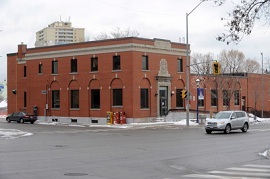 The City will be moving forward with heritage designation of this property now that it has been sold -- the Heritage Advisory Committee will be placing this on their Agenda. There have been questions about the Coat of Arms removed from the front addition of the building. The Feds have repossessed their symbol as the building is no longer a Post Office, and the old metal 'Customs and Excise' lettering over the back door is gone as well, but the embedded arms over the front door remain. There has been intense community interest in adaptive re-use of this landmark heritage 'gem', including provision of community space. 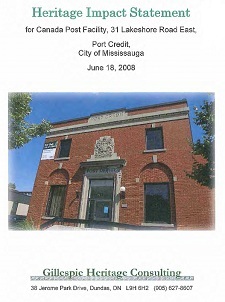 VIVA PORT CREDIT LETTER: Click here to view VIVA Port Credit's letter to the City regarding the Post Office, including pictures and aerial view, dated July 9, 2008. CITIZEN-DRIVEN VISION: In 2009, local architect Michael Spaziani (MSAi) created a conceptual site plan and design (provided pro bono to the community after consultation with TOPCA) to help articulate the citizen-driven vision for mixed-use (no residential) for this waterfront site situated beside the harbour's public realm. In addition, pro forma cost/revenue projections were made to illustrate economic viability. ► The MSAi presentation is up on Flickr with inspiring new 3-D images (click to view). 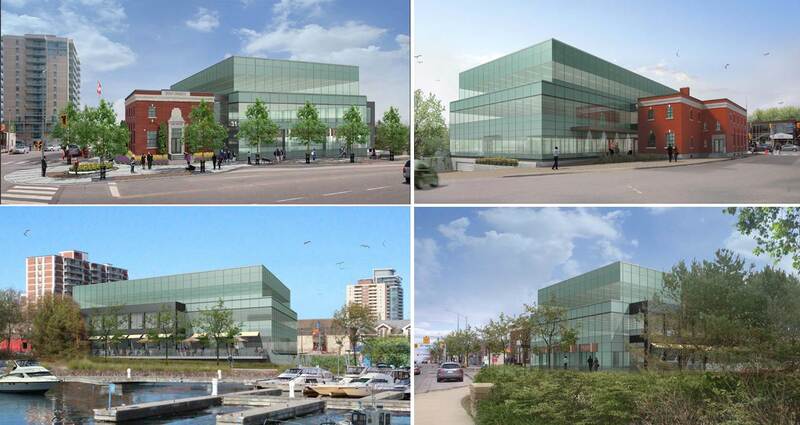 Below are the Lakeshore Road and Harbour elevations, respectively. MEETING WITH PCLAP: The Post Office issue was on the Agenda for the September 15, 2009 meeting of the Port Credit Local Advisory Panel, as requested by Councillor Corbasson. At the request of TOPCA, Michael Spaziani first presented his design concepts at this community forum. ► Click to view the Official MINUTES of the Sept. 15, 2009 PCLAP meeting. COMMUNITY VISION: A community-driven vision for the Post Office redevelopment was presented at TOPCA's Public Meeting on November 4, 2009. 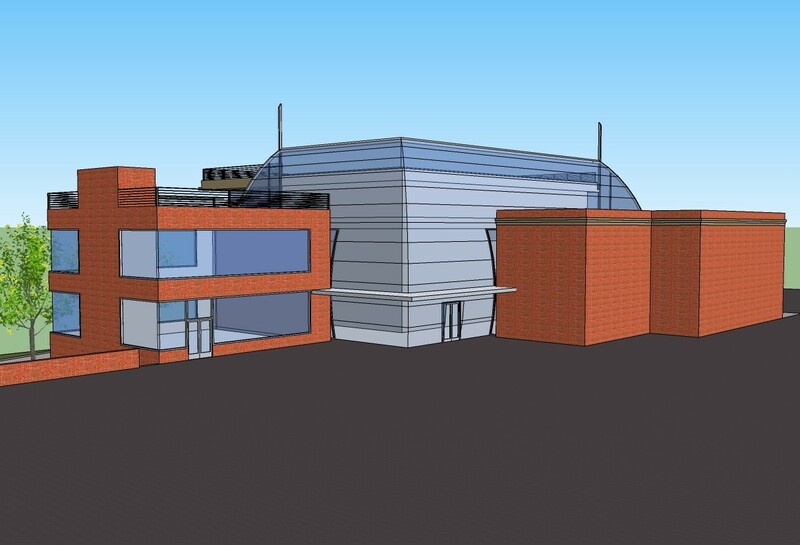 Architect Michael Spaziani (MSAi) generously consulted pro bono with TOPCA for this conceptual design. ► Click to view the TOPCA PROGRAM including bios. MEETING WITH CITY: A meeting was held on January 12, 2010 with Mayor Hazel McCallion, then-Ward 1 Councillor Carmen Corbasson, Mississauga South MPP Charles Sousa and Commissioners Paul Mitcham (Community Services) Ed Sajecki (Planning & Building) and Martin Powell (Transportation & Works) along with senior City staff and the reps of eight (8) local community organizations in order to discuss future options for the Post Office site. 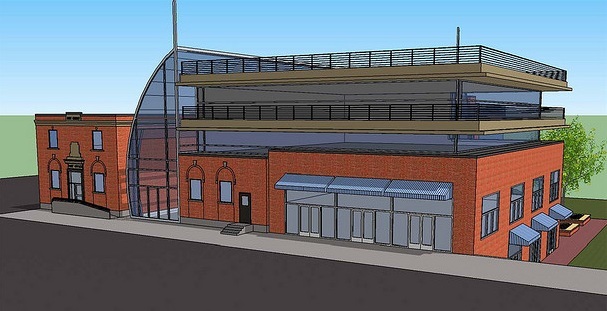 All parties want to ensure that appropriate redevelopment of this acknowledged 'gem' occurs. Michael Spaziani presented his design concepts at this high-level forum. ► Click to view the meeting AGENDA. ► Click to view the meeting NEXT STEPS as agreed by all parties. MEETING WITH CANADA POST: A meeting was called by Mayor Hazel McCallion on January 28, 2010 to enable Moya Greene, then-Canada Post Corp CEO and President, and Ray Simard, CPC General Manager (Asset Management) to receive the presentation by architect Michael Spaziani (MSAi) regarding the citizen-driven vision for redevelopment of the Port Credit Post Office. Also present were then-Councillor Carmen Corbasson, Planning and Building Commissioner Ed Sajecki and Community Services Commissioner	Paul Mitcham, along with Jim Danahy, co-president of TOPCA, and Dorothy Tomiuk of the TOPCA Executive. The Mayor stated clearly that this is about more than CPC just getting its money: why waste everyone's time going around and around with developers when we can work together and do the right thing by the community, to which CPC has a public obligation. The Councillor made clear that no variance from the spirit of the Port Credit Directions Report will be considered. The Commissioners underscored that the City will stand firm in the face of inappropriate development applications, within the strong planning framework which has emerged from the Port Credit District Policies review process. Jim Danahy (TOPCA director) emphasized that best adaptive redevelopment of the Post Office site is of the highest importance to Port Credit citizens, who will work in solidarity with the City and seek the cooperation of all levels of government in order to get this right. 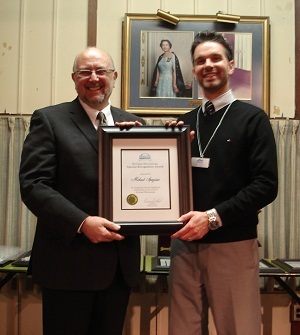 HERITAGE AWARD: Congratulations to Michael Spaziani (at left) for receiving a Special Recognition Award from Heritage Mississauga, as presented on February 18, 2010. Michael's assistance to the Port Credit community regarding the Post Office visioning was cited among many other volunteer contributions Michael has made in support of heritage retention and sympathetic urban design. 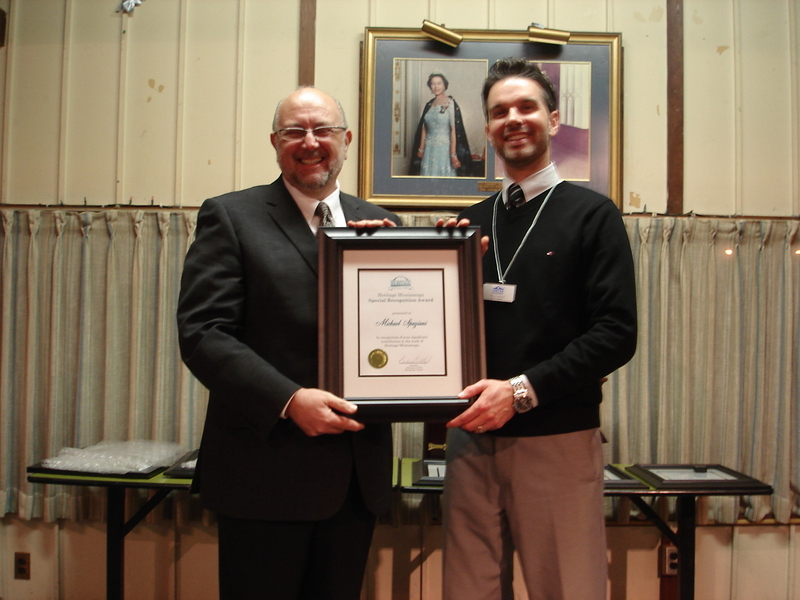 The award was presented by Greg Carraro, VP of Heritage Mississauga (at right). POST OFFICE FOR SALE: Canada Post moved to a new facility in Lakeview in 2008. The Port Credit site at 31 Lakeshore Road East (map) at Stavebank Road South was recently FOR SALE again (as of May 2009), having been taken off the market in Jan. 2009 after a proposed purchase by Centre City Capital for adaptive reuse as a conference centre (complementary to The Waterside Inn) fell through. 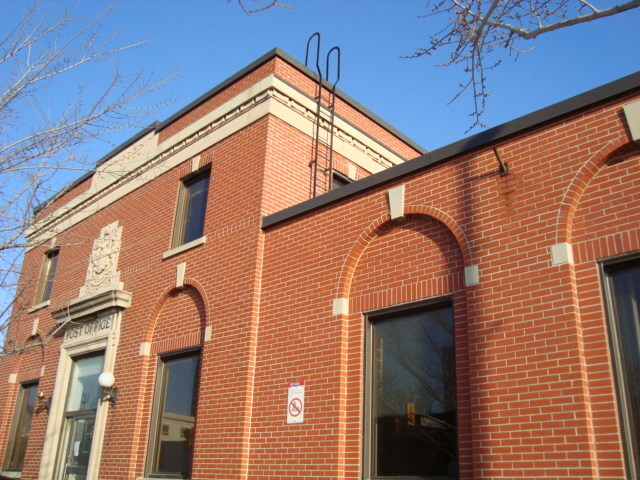 The City has decided not to bid on this property, but has indicated the intention to designate the Post Office as a heritage site once it is transferred to the new owner. August 2010: There has been a change of management, with the former CEO of Canada Post (who met with community reps and the Mayor, Councillor and City Staff in January 2010) having now left and a new Real Estate Manager also in place. 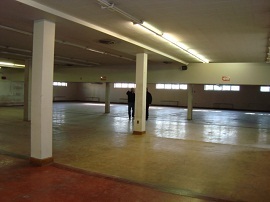 Significantly, and further to requests of local residents' associations, Canada Post has now completed a phase 2 environmental study and is preparing a Risk Assessment and Record of Site Condition that would give the building a clearance for commercial and residential use without expensive soil remediation. Canada Post is also working on a parking strategy with the City that might recognize the parking deficiency (possibly 72 spaces) associated with the Post Office use and grandfather that reduction to any new financial/site plan equation to enable appropriate development without having to build height above ground to pay for expensive, excavated parking (if even possible) that would otherwise be required on-site. Once Canada Post has established these reports and recommendations, they will put the P.O. building back on the market and offer to the (approximately ten) previously interested bidders. TOPCA STATEMENT: During July 2009, members of the TOPCA Executive met twice with representatives of Davies Smith Developments who were the latest Conditional Purchasers of the Post Office property. The conditional period ended on August 24, 2009 and we have received notification from the developer that they will not be proceeding with their proposed 9-13 storey seniors' condominium project and have let the purchase offer lapse. Davies Smith devoted considerable effort towards community engagement on this venture, and provided professional evaluation tools while seeking citizen input. In the end all agreed this very special location needs to be developed as a "true gem". 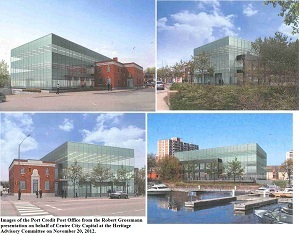 After two unsuccessful private development proposals, it is now very clear that adaptive reuse of the Port Credit Post Office site will require more proactive involvement by the City's Planning Department, our Councillor, residents and other levels of government to realize the appropriate kind of development envisioned in the City’s exciting new Port Credit Directions Report. This critical gateway site at the junction of the mainstreet (Lakeshore Rd.) and the Credit riverbank must be a focal point for both economic and public needs, not only on the old Post Office site itself, but in close harmony with adjacent retail, harbour parks and the extensive federal port lands to the south (at the Marina). A mistake here would be very damaging to the overall plans for the comprehensive redevelopment planned for Port Credit's waterfront. Then-Ward 1 Councillor Carmen Corbasson put this topic on the Agenda of the Port Credit Local Advisory Panel, which met on Sept. 15, 2009. TOPCA is represented on this Panel. The Panel's objective was to determine how to inspire and attract innovative development proposals for this unique site. Mixed land uses, transportation innovations and area-wide, rather than site-specific solutions to issues such as parking, loading docks, etc., will need to be part of the design package to achieve the vision citizens have worked so hard to create for our historic waterfront village. Click here to view the official MINUTES of the PCLAP meeting. COMMITTEE OF ADJUSTMENT: Thurs. 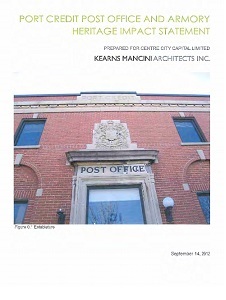 Jan. 31, 2013 @ 1:30 p.m.
► Click to view the REQUESTED VARIANCES (2p PDF) for the Post Office redevelopment (as deferred from Dec. 13, 2012). 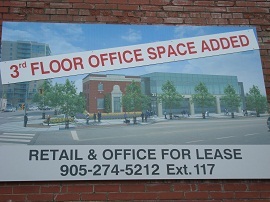 ► The leasing sign on the Post Office wall (as of July 2012, and still up as of January 13, 2013) shows only a 2-storey addition, rather than what is actually proposed (3-storeys, as shown at left). THIS SIGN IS MISLEADING. This does NOT constitute appropriate public notification. NOTE: A banner was added to the image, the week of Jan. 14, 2013. ► For a TOUR of the interior of the 3-level Post Office, see the TOPCA Photo Album (109 images) posted on our Facebook page. Enlargement. 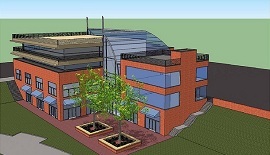 ►Click to view the community driven vision for the site (courtesy: MSAi) which retains most of the Post Office building and the 2 heritage trees. --------------------------------------------------- ► Mississauga News article (Feb. 1, 2011): Heritage decision delayed. Excerpt: "The owner of an 80-year-old post office in Port Credit is worried that he won't be able to build retail shops and offices in the building if the municipality designates the structure as a heritage property. 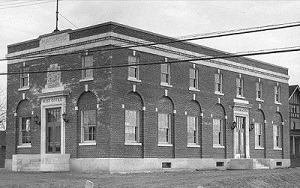 The City of Mississauga's Heritage Advisory Committee is putting off a decision on whether to designate the Port Credit post office as a heritage building until the owners of the property can commission a heritage impact statement.